Joining a growing handful of previously declared candidates, New York Senator Kirsten Gillibrand (D-NY) announced that she too would be making a bid for the Democratic Presidential nomination in 2020. Perhaps better known for #MeToo, the recently re-elected Senator has made a name for herself on domestic issues related to military and college campus sexual assault, in addition to Congress’ own sexual harassment problem. However, having been on a Congressional Armed Services Committee since 2007, Gillibrand, whose career began amidst an anti-Iraq War environment, is no stranger to foreign policy issues. At times the Senator has put forward legislation specific to the Gulf region, establishing herself as a leading voice against a nuclear-armed Iran. However, with the Senator’s recent leftward lurch, it remains to be seen if the compromises that typified her early foreign policy attitudes will be maintained as part of her progressive rebranding. The Gulf issue that seems most relevant to the Senator’s Congressional tenure is the threat of a Nuclear Iran. In her statement announcing support for the Iran Nuclear Agreement upon its initial finalization in 2015 Gillibrand commented, “Beginning in 2010, I helped champion in Congress an aggressive and punitive series of sanctions against Iran because we faced an Iranian nuclear program that was spinning unchecked and out of control.” Here, the Senator refers to the ‘Gulf Security and Iran Sanctions Enforcement Act,’ a bill introduced in 2010 of which Gillibrand was the primary sponsor. Although the bill ultimately never made it past the introductory phase, if passed it would have added restrictions to better ensure that the sale of oil produced from the Outer Continental Shelf did not violate the terms of the Iran Sanctions Act of 1996. Understandably, given this history, Gillibrand joined the majority of her colleagues and criticized President Trump for withdrawing from the deal. Additionally, Gillibrand joined most of her fellow Democrats and lamented Saudi Arabia and the American response to the murder of Jamal Khashoggi. In sum, the potential Gulf oriented policy of a hypothetical Gillibrand administration is likely to be in line with the overall Gulf foreign policy of the Democratic party in general. Still, when it comes to Iran’s Nuclear Program, Gillibrand is certainly not bloviating when she proclaims to have been pushing the issue for quite some time. Additionally, with Gillibrand perhaps being the most prominent politician within the #MeToo movement, it is not unfounded to think that her Gulf policy, and foreign policy in general would have a special emphasis on female empowerment. 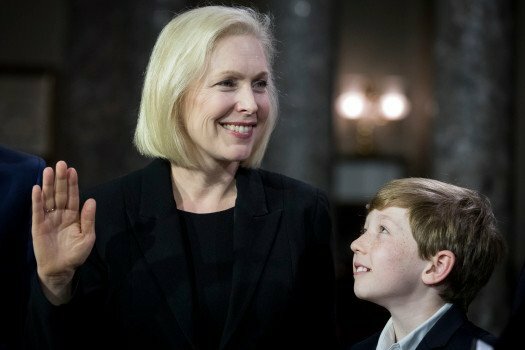 As far as her chances, most commentators at least mention Gillibrand as a credible candidate, however she has struggled to stand out within the pack. Regardless, with a campaign coffer that is only surpassed by Elizabeth Warren, Gillibrand certainly has the cash to mount an effort that forces the Gulf to take her potential policies seriously. Rebecca Traister, “Kirsten Gillibrand is an Enthusiastic NO” New York Intelligencer, April 3, 2017. The U.S Congress Votes Database, “How Kirsten Gillibrand Voted on Key Issues,” The Washington Post. Ilan Wurman, “Vote on Iraq Funding Bill Triggers Primary Challenge for Gillibrand,” The Hill, May 31, 2007. Ben Smith, “Gillibrand Aide: Senor’s Iraq Role at Issue,” Politico, March 11, 2010. Kirsten Gillibrand, “Why I’m Supporting an Imperfect Iran Deal,” Office of Senator Kirsten Gillibrand, August 06, 2015. U.S Congress, Senate, Gulf Security and Iran Sanctions Enforcement Act, S.3810, 111th Congress, 2nd Session, Introduced September 21, 2010. Kirsten Gillibrand, “Statement on President Trump’s Decision to Leave the Iran Nuclear Agreement,” Office of Senator Kirsten Gillibrand, May 08, 2018. Fredreka Schouten, “Democrats Are Getting Ready to Run in 2020. Who Has the Money Advantage,” CNN Politics, January 2, 2019.